Volatility persisted in the second quarter of 2018 as concerns about rising trade tensions, US-North Korea relations and deleveraging in China deepened. Greater China equities (as represented by the MSCI Golden Dragon Index) ended the period with a 3.7% fall (in USD). We saw two major sources of volatility as we navigated an increasingly turbulent market in the second quarter – the US-China trade war and China’s deleveraging bias. In mid-June, US President Trump approved the final list of goods to be included in the application of a 25% tariff on $50 billion worth of Chinese imports in which $34 billion will be implemented on 6 July as part one. Shortly after, China threatened to retaliate by imposing tariffs of “the same strength” on US goods. As the back-and-forth continued, we believe that the trade war will get worse before it gets better because of Trump’s tendency to strain relationships to the limit. Despite this negatively affecting specific sectors and companies, we reiterate our belief that the impact of the tariffs on China’s overall economy will be limited – a 25% tariff on $50 billion of Chinese imports is equivalent to a mere 0.1% of China’s GDP and only affects 2.2%1 of China’s total exports. 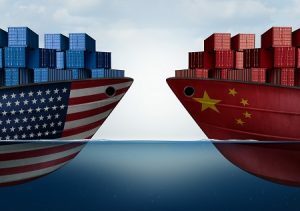 We continue to believe that the two sides will resolve the dispute through negotiations eventually, but fear and uncertainty in financial markets will linger, and investors may feel the pinch of the trade war in the short term. The number of bond default cases has been ratcheting up since the start of the year – 16 cases from eight issuers worth a combined RMB14 billion were reported year-to-date. Although default cases continued to cloud investor sentiment in the onshore market, we see them as an anticipated consequence of the deleveraging and de-risking measures that Chinese authorities have been implementing to weed out poor quality companies. Allowing defaults can also help to improve price differentiation in China’s credit market, where the credit spread on high yield papers has widened to 300 basis points in early June from as narrow as 50 basis points in March. While deleveraging policies will burden China’s GDP growth, we believe that China’s policy makers will remain flexible by constantly reviewing and fine-tuning policies so as to avoid a sharp deceleration in economic growth. The nimble policy approach was evidenced by the two RRR cuts by the People’s Bank of China (PBOC) in the second quarter to inject liquidity into the market. On the other hand, contrary to the Fed’s rate hike policy, the PBOC injected net liquidity of RMB403 billion via its medium-term lending facility (MLF) in June. This, together with the State Council’s plan to ease financial constraints for SMEs, also signals more policy fine-tuning could be possible. That said though, we expect deleveraging to remain the priority, and policies will continue to have a tightening stance to achieve quality growth in the long run. Amid the market pessimism, encouraging signs were often left unnoticed. In China, macro data reflected a sanguine economy this year, with revenue and earnings growth remaining strong, profitability continuing to improve, capital expenditure rebounding, and debt levels staying largely stable. China’s corporate earnings growth has stayed on track against this favorable backdrop – expected earnings growth for offshore China equities in 2018 was revised upwards to 16%2 (vs. 14.9% in 1Q). However, we will closely monitor how the actual implementation of tariffs will change over time and whether it will lead to any potential disruptions to the operating efficiency of individual companies in our portfolio. We will also keep an eye out for any material signs of deterioration in China’s macro data. From a sector perspective, we continue to prefer domestic consumption space, especially for companies with a quality earnings outlook that is less sensitive to macro event risks such as education operators. In financials, the recent bond defaults in the onshore China market have reignited concerns about China’s debt problem and consequently, the asset quality of Chinese banks. However, we see stable profitability for Chinese banks and we view the near-term asset quality stress as a consequential side effect of the ongoing deleveraging process, which, more importantly, will be positive for the long-term health of the Chinese financial system. Looking ahead, volatility may persist in the market for an extended period of time as the US-China trade war drags on, but investors need not stay on the sidelines. After the recent market correction, valuations of China equities have become more attractive at 12.63 times price to earnings, as compared to the January high of 14 times. We continue to see near-term market headwinds as buy-on-dip opportunities for long-term investors provided that China’s macro fundamentals stay solid.